Sylvan provides professional tutoring, academic enrichment programs and STEM camps for students of all ability levels from JK to Grade 12. Choose from Reading, Writing, Math, SAT/ACT Prep, Chemistry, Physics, High School Math, Homework Support, French and STEM. At Sylvan we know your child is smarter than their grades. Contact us today. Sylvan Learning Centres were founded in 1979, and the company has grown to include locations throughout North America. Sylvan’s reputation has grown as well, principally through the visibility of the locations and their association with effective academic tutoring. Still, there is more to Sylvan than perhaps most people may know, and the seasonal camps and programs are included in that. Yes, the focus can look somewhat academic at first glance—engineering, STEM, robotics, coding—though the feel of the camps is less formal, less academic, and more geared to gather children around topics and activities that they are passionate about, in addition to having fun. They will learn a lot, no doubt, though often the empowerment that the camps can bring is, for many families and kids, their principal value, and the thing that keeps them coming back year after year. Who better to deliver exciting Academic & Enrichment Camps than Sylvan Learning? For over 35 years Sylvan has been the leading provider of supplemental education across North America. We have drawn on that experience locally, to design what we believe are some of the best academic camps available. 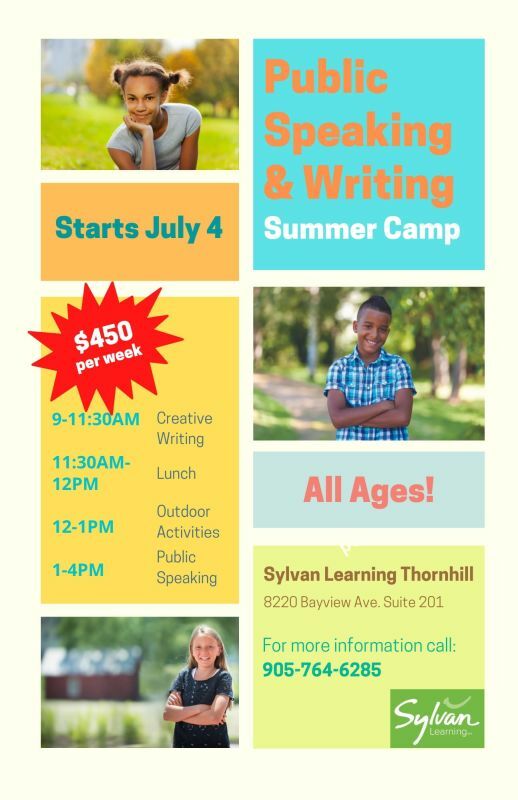 If you are a parent who wants their child to have fun and be challenged intellectually during the summer, then the Sylvan Academic & Enrichment Camps are for you. WHY CHOOSE SYLVAN SUMMER CAMPS FOR YOUR CHILD?  Our “Stealth Learning” approach means your child will have fun while learning. Focused on strengthening core reading and early writing skills. Aside from fun, all camps will include applied elements of STEM and Language Arts. Our Stealth Learning approach means that, while you will not see text books in the Sylvan camps there will be consistent use and application of essential academic skills such as math, science, technology and literacy. All of the camp modules will be age appropriate to the group and our low Teacher to Camper ratio will ensure all of the activities will be delivered in a fun and supportive individual and team format. We are happy to share our daily and weekly schedlues with you upon request. WHAT ARE THE WEEKLY THEMES? Children love fun themes and these will differentiate each week of camp so your child will never be bored, no matter how many weeks they attend. Weekly Themes include: CSI Forensics, Smart Super Heroes, Brain Game Olympics, Earth & The Environment, Space Odyssey, Exploring Ancient Worlds, Myths & Mysteries, Fantastical Fiction, News & Clues. Regardless of the specific theme, each camp includes critical areas of applied learning such use of creating thinking and logic, math and science (STEM), the examination and comparison of facts and fiction and the use of individual and team projects and challenges in an engaging and dynamic manner. We use a wide variety of entertaining learning media which will vary from week to week. This use of media will align with our theme and will involve investigation, exploration, discussion, analyzing, measuring, building ideas, structures and theories. Every third week there will be a camp that uses Robotics combined with interactive Lego WeDo software, which we will use to enhance our STEM learning. We will also do further ‘drag and drop’ computer coding techniques using Tynker to allow campers to learn how to build their own video games. We are confident that if you have a curious child or one whom you know enjoys having fun in a group environment, then they will thoroughly enjoy our camp. As a parent you will also have the comfort of knowing they are having a fun and intellectually engaging summer. I like the personal approach and the way each teacher gets to know the student in order to be able to help to improve in school. You have to understand why isn't the student doing well to begin with, and then work on the issue. Proven fast improvement in students writing skills, great collaboration between student and instructor, great instructor parent collaboration and open channel of communication. Quality, results, flexibilty, help literally with everything, every subject. Efficient response to enquiry and excellent assistance with everything we required! Will most definitely recommend Sylvan of Thornhill. Interested in Sylvan Learning Thornhill?